Challenger 4015EFX Four Post Closed Front Car Lift 15,000 lb 78″ rise height, the highest rise in the industry provides maximum head room for working underneath vehicles. The highest rise in the industry provides more work space underneath vehicles. Single point air actuated lock release disengages all column locks simultaneously. 14 level locking positions for a variety of alignment and general service tasks. 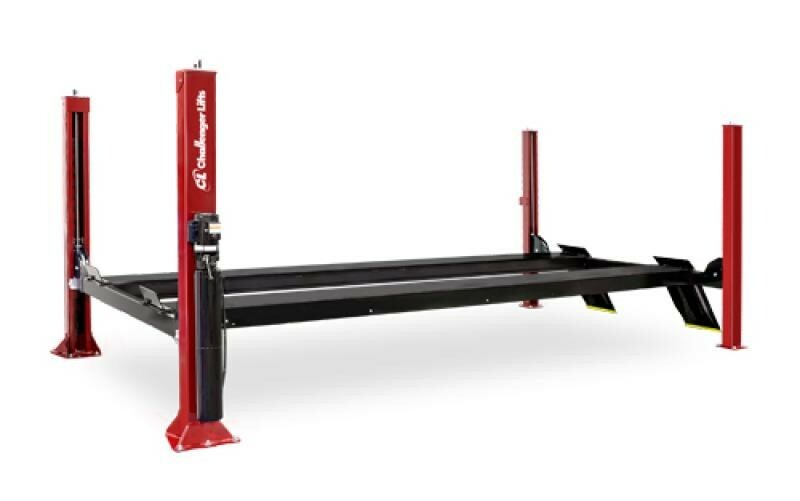 80″ rear recessed free floating slip plates offer a wider range of 4 wheel alignment capacities and accommodates longer wheelbase vehicles. 14 level lock positions allows technician to work at an ergonomic working height to increase productivity and minimize fatigue. 9-1/2″ steel pulleys, Teflon® bearing and 1/2″ cable diameter minimizes undo wear and tear and prolong pulley and cable life. Heavy-Duty front bearing and yoke assemblies distribute contact load to reduce column stress for longer product life. Recessed stainless steel turning radius gauges provide more precise alignment readings.